Covered Bridges are part of the rich historical heritage of Ashtabula County. Naomi Olin Bottorf devoted a great portion of her life to the preservation of Covered Bridges. 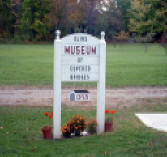 In tribute to her goals and interests, Olin's Covered Bridge Museum was founded in 2003 by her family. We are a non-profit organization. Our mission is to continue those goals by building public interest in the knowledge and preservation of covered bridges, and to share the broad variety of covered bridge items and informational materials that comprise the collection of Naomi Olin Bottorf. Curators are available from June 1 thru October 31st; Wednesday, Saturday. and Sunday; 1:00PM-5:00PM. The only exception is that we are closed the second weekend of September. We are also available year around, by appointment. We will happily try to accommodate you at any time, upon request. Our Museum will have special hours during teh 2nd weekend of October to accommodate visitors during the Ashtabula County covered Bridge Festival. Hours will be 10:00AM-6:00PM.